Shalini Garg is the Founder-Director of Sunatya Academy of Performing Arts, a multidisciplinary platform established in December 2014 for the exploration and practice of different kinds of performing arts, mostly based in dance and music. She is a renowned Kathak dancer and choreographer based in Bangalore. As of 2018, she has been a student of Kathak for about two decades. She graduated with great laurels from Panjab University with a MA in Kathak in 2005. She then pursued her PG Diploma in Kathak and Choreography at Natya Institute of Kathak and Choreography in 2007. Ever since, she has been exploring, learning and teaching the art of Kathak in collaboration with various institutes, artists and now independently. In the course of her tryst with Kathak, she has had the good fortune of training under the likes of Guru Shobha Kausar ji and her daughter Ms. Purva Kausar ji in Chandigarh and Ludhiana respectively. She has also been blessed with the constant guidance of Guru Pt. Rajendra Ganganiji of Jaipur Gharana. Late Guru Dr. Maya Rao also was a very strong influential force in her choreographic training over the years. She has also learnt from exemplaries like Guru Shrimati Kumudini Lakhiya ji, Guru Pt Birju Maharaj ji, Mamta Maharaji ji, Prashant Shah ji and Vaishali Trivedi ji. As a part of exploration of her discipline, she has even trained in dance forms like Chhau and Oddissi for a little while. During her foundation years, she worked and performed with Nritarutya, an Indian Contemporary Dance Company for 3 years, whereby her contemporary training of the body was instilled. 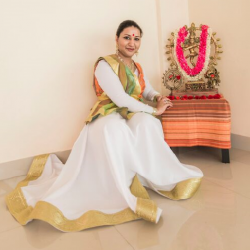 All through these varied opportunities and experiences, Shalini has always worked on nurturing and strengthening her craft in Kathak and has performed and choreographed multiple performances across scales, occasions and venues in Bangalore in the past decade. She also organizes an annual dance show, NIRMITI where the students of Sunatya get an opportunity to share their learnings on stage with an eager audience every year. Her work has been recognized, appreciated and encouraged by her students, peers, teachers, critics and dance gurus alike.